Jurgen Koch at Fraser Yachts in Palma confirms that another €100,000 has been snipped off the price of his central listing, the 30.48m sailing yacht Garuda. An ABS classed Swan 100 model sailing yacht, she was built in 1986 by Nautor’s Swan in association with naval architect Ron Holland with styling by Jon Bannenberg. This 165 ton superyacht can accommodate six guests in one master and two twin cabins, while a 550hp Mercedes-Wizemann diesel engine offers a cruising speed of 10 knots with a maximum speed of 13 knots. Garuda was recently refitted including a fresh paint job and hasn't been used since. 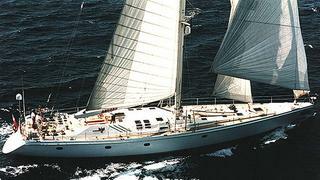 Currently lying in Palma de Mallorca, her asking price has come down from €1.65 million to €1.55 million.